This week's charts cover the period from November 19th to 25th. There was only one new entry in the free-to-play chart, although it was 2K’s NBA 2K Mobile and it came in at the top spot on iOS. Elsewhere, Ironhides’ Kingdom Rush Vengeance debuted sixth on both iOS and Android in the paid charts. 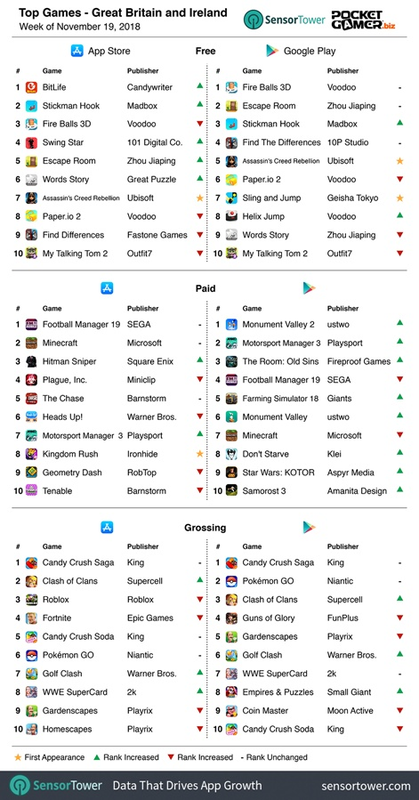 Regarding movement in the charts, Roblox snagged the top spot iOS grossing charts while Supercell’s Clash of Clans and Clash Royale jumped up to fourth and 10th respectively. Ubisoft’s Assassin’s Creed Rebellion made a fine start to life in the UK charts and debuted at seventh and fifth on the iOS and Google play free-to-play tables respectively. Ironhides’ Kingdom Rush also made an appearance in the UK and appeared at eighth on the iOS paid charts. Supercell’s Clash of Clans was also on the move in the grossing charts and jumped up to second on the iOS chart and third on the Google Play chart. The iOS chart in China saw several new additions for the week. Shanda Games’ Legend of Honor made its debut at third while Hero Game’s Warfare Legends’ and Chengdu Momo’s Digimon came in at fourth and fifth. 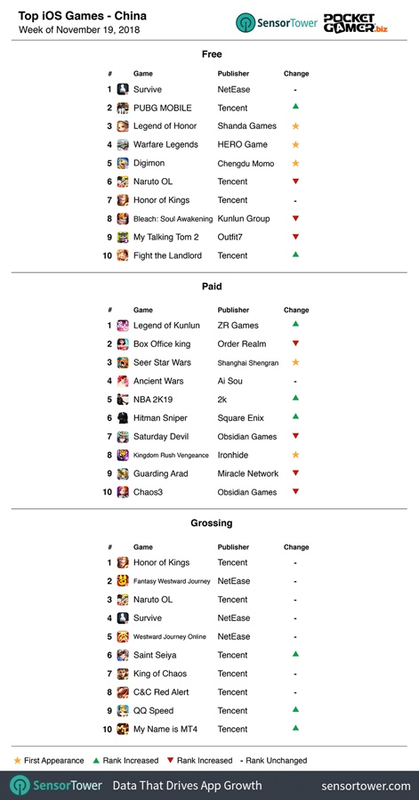 The iOS paid charts, meanwhile, saw debuts from Shanghai Shengran’s Seer Star Wars at third and Ironhides’ Kingdom Rush Vengeance at eighth. Concerning movement in the charts, Tencent’s PUBG Mobile jumped up to second on the iOS free-to-play charts while ZR Games’ Legend of Kunlun made it to the top of the iOS paid chart. 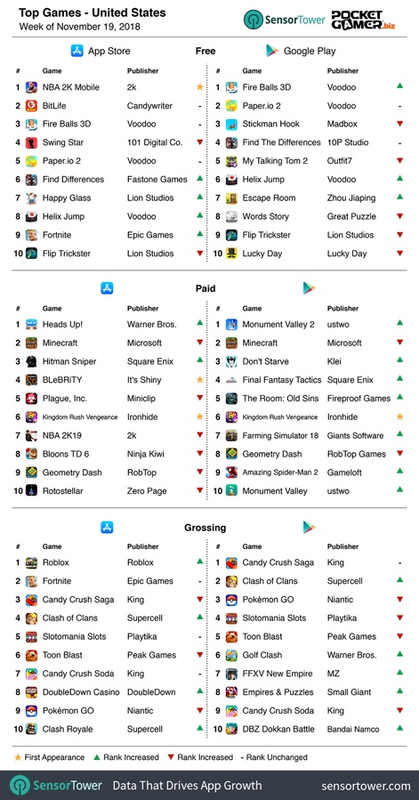 A number of the world's top mobile games companies featured in these charts, including King, will be at Pocket Gamer Connects London on January 21st to 22nd 2019.